Personalized All Stainless Steel Tumblers Custom Printed in Bulk. Promotional, Very Inexpensive. Translucent Blue, Green, Gray or Yellow. Lowest cost in USA, Canada. 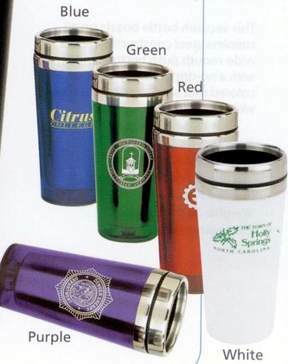 Wholesale fully stainless steel personalized tumblers at the Budget Prices in USA and Canada. Stainless steel lid adds a touch of class to this elegant tumbler. Our stainless steel liner is recommended by the FDA over plastic liners which may release harmful chemicals in your drink. It fits snuggly in your car mug holder. Free artwork design. We will send you a proof for your approval before production. American clients don't pay taxes. Price include 1-color imprint on 1 or 2 sides. We also supply blank (not imprinted) stainless steel tumblers: please use the next-column price. Add $0.80 per unit for each extra imprint color. Setup Charge: $40.00 per color, per side. Sip Through Steel Lid, Spill Resistant, Insulated. Weight: 24 tumblers / 18 lbs per box.